I was sorting out spare mechanisms I have refurbishing them and came across a 5C Mills item which has a label stuck on the side of the frame with a number, date and Fremont included. Anyone know whether this was used for a purpose, maybe Fremont Casino or seen similar before? December 17, 1962, refers to the effective date of the Gambling Devices Act of 1962 which modified the Johnson Act. Machines manufactured prior to that date are exempt from some of its requirements, though I don't understand all the nuances of how that worked - hopefully someone will. I think the tag had to be put on by licensed gambling establishments using such older equipment. Ah great thanks, makes sense. Had a quick look at the act which came out in 1951 and changed many times. This modification refers to a change on the link below. 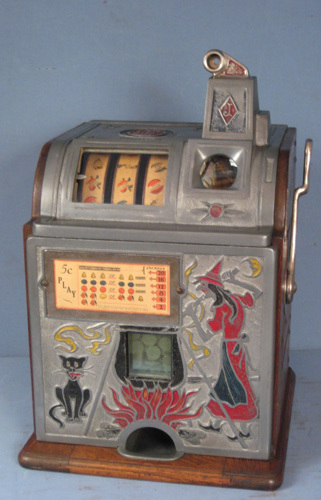 A registrant in possession of gambling devices manufactured prior to the effective date of this statute should affix a serial number thereto if one is not already so affixed, together with registrant's name and trade name, and a statement indicating that the device was manufactured prior to December 17, 1962.